Tim Richardson, who lives in Southfields, contributed this article after going on a Vauxhall Society guided history walk of the Vauxhall foreshore. A notable local contribution of the Vauxhall branch of the Richardson family brick-making firm was to the foundations of what is now the Kia Oval cricket ground. Originally we thought that the Oval cricket pitch itself was built on Richardson bricks, but I have since learnt that the foundations of the pitch is actually gravel from the river Effra which passed along one side of the Oval. Richardson bricks probably provided the foundations for the 1889 pavilion, although I have yet to prove this. I do have a brick extracted from the foundations of the Oval pavilion, but it remains caked in cement, waiting for me to have enough time to chip it all off and see whether it is indeed a Richardson. I began looking into the Richardson family history in May 1979, when my grandfather Arthur Maurice Richardson wanted to know the background to his mother’s side of the family. Her first name was Ada and her surname was Ada, and rumour had it that she was the daughter of a certain Ada who was a servant in the Royal Household who got the “Order Of Take Off The Garter”. No truth in that, as it turned out, but then I have yet to meet a family that does not claim some sort of royal connection or other. Through my grandfather I was invited to tea with Nesta Monsell, a grand old lady living in a grand old flat in Onslow Square. Fortunately for her, my heritage research was in its infancy, so I could not bore her to death on the subject. Instead she was able to entertain me by talking of dozens of people I had never heard of and, in the course of the conversation, give me a photograph and a card. The photograph and pamphlet both celebrate the centenary of the firm A & WT Richardson in 1950 in Paddington. Centenary lunches are the holy grail of researchers, because if there is one thing you can guarantee, the celebrants will not resist waxing lyrical about their heroic deeds over the last hundred years, and in this A & WT event did not disappoint. The Wood Lane Brickworks provided a million foundation bricks for the Royal Albert Memorial, possibly free of charge, because the memorial was funded by subscriptions and donations. Charles Richardson founded the company in 1850, just as a tax on bricks was repealed, and could certainly afford such largesse as when he died in 1890 he left a fortune . There was a Richardson brickworks in Teynham, Kent, and the company operated from two London premises, one at Paddington Wharf and the other at Brunswick Wharf, Vauxhall. Exactly when the Richardsons of Vauxhall arrived and departed I have yet to establish, but it might have been as early as 1863. Until 1896 my great great grandfather William Pengilley Richardson lived in Brunswick Lodge, a building on the east side of Brunswick House, presumably where the Brunswick House Cafe is now. The 1881 Census states that William was a railway manager on the Cornish Line, possibly a service running from across the road at Nine Elms Station. By 1891, however, my great grandfather was a manager with Richardson’s. Beside Brunswick Lodge stood Brunswick Wharf, leading to the Thames, where the family had a builders’ merchants’ depot serving Vauxhall and the surrounding area. Over the decades, millions of Richardson bricks passed through – and must occasionally have fallen into – Brunswick Wharf and Paddington Basin. 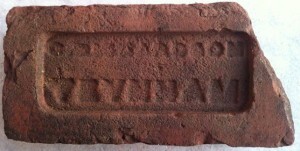 Surprisingly, not a single Richardson brick has been found, with one exception. An inquiry to the Teynham History Society did produce a single brick, apparently part of a garden path in Newnham. The Richardsons left Vauxhall early in the 20th century and all trace of their premises disappeared with building of the St George Wharf flats. However, here’s hoping that some day a beachcomber poking about on the foreshore west of Vauxhall Bridge will turn up a Richardson brick.